Use this lens with color linescan cameras having one to three sensors. 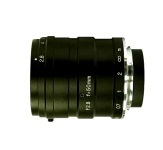 With a standard F-mount, they offer ultra high resolution, low chromatic aberration, and excellent edge brightness. Designed for industrial machine vision applications, this lens has thumbscrews for locking down the focus and aperture adjustments.